Points Needed: 12550 Games are not compatible with mobile and tablet devices. Please add this title to your Wish List and sign on to your the first club account from a desktop computer to complete your redemption. NOTICE: Activation key must be used on a valid Steam account, requires internet connection. 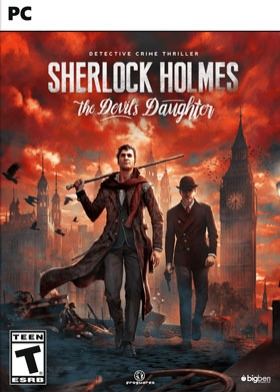 ABOUT THE GAME	Sherlock Holmes: The Devil’s Daughter is a fantastic adventure with unique gameplay that blends investigation, action and exploration for an extraordinary experience that will test the limits of your nerves and intelligence. Track down evil in the darkest corners of London and the huma… n soul while playing as the great detective, as you untangle a web of intrigue leading to the final stunning revelation. KEY FEATURESEach of your deductions and actions affects the rest of the story, for better or for worse… Play as Sherlock Holmes and use his extraordinary abilities to progress through the adventure. Freely explore several of the city's neighbourhoods in search of clues and suspects. Interrogations, combat, chases, infiltration… discover a game that is unlike any other!SYSTEM REQUIREMENTS Minimum: OS: Windows 7 64 Bit / Windows 8.1 64 Bit / Windows 10 64 Bit Processor: INTEL Core i3 3.6GHz / AMD FX Series 4.2GHz Quad-Core Memory: 6 GB RAM Graphics: 1024 MB 100% DirectX 11 compatible AMD Radeon HD 7790 / NVIDIA GeForce 460 GTX DirectX: Version 11 Storage: 20 GB available space Sound Card: Yes	Recommended: OS: Windows 7 64 Bit / Windows 8.1 64 Bit / Windows 10 64 Bit Processor: INTEL Core i5 2100 3.1 GHZ / AMD A8-7600 3.1 GHz Memory: 8 GB RAM Graphics: 2048MB 100% DirectX 11 compatible ATI R9 270X / NVIDIA GeForce 760 GTX or higher DirectX: Version 11 Storage: 20 GB available space Sound Card: Yes	©2016 Published by Bigben Interactive S.A. and developed by Frogwares. Published under license and authorization of Frogwares. All rights reserved. Sherlock Holmes, Frogwares and their respective logos are trademarks of Frogwares. Unreal, the circle-U logo and the Powered by Unreal Technology logo are trademarks or registered trademarks of Epic Games, Inc. in the United States and elsewhere. Powered by Umbra 2006 - 2016. See umbra3d.com for details. ©2016 Valve Corporation. Steam and the Steam logo are trademarks and/or registered trademarks of Valve Corporation in the U.S. and/or other countries. All other trademarks, logos and copyrights are property of their respective owners.